Security Levels settings allow or disallow certain functions within an allowed menu item. For example, you may wish an employee to access Manager/Setup but not to access charge/payment/tax setup. Likewise, you may allow an employee access to front desk and reservations but you do not want to give the employee the ability to change room rates or void transactions. Since this is a required field for new User ID setup, you may create one security level and apply it to all users. Go to System Maintenance > User I.D. / Security Setup > Define Security Levels. 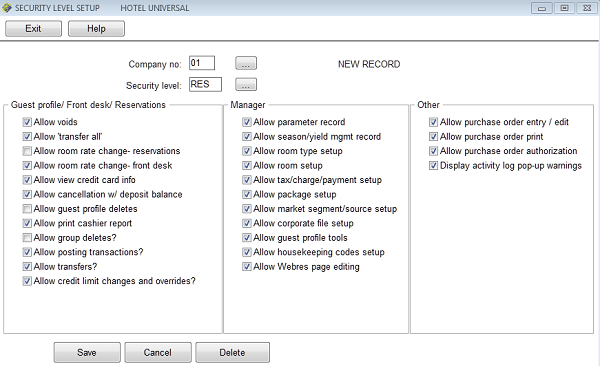 The above screen shows a security level RES which disallows room rate changes on the reservation screen, guest profile deletes, and group deletes. Note that those items have been unchecked. When the screen opens your cursor will be at "Company no". Enter a two-digit company code or enter ** to set these levels for all companies. Press Enter. At the "Security Level" prompt enter any code up to four characters such as A1 or NAUD. Press Enter. All items will be checked. Uncheck the items you want to restrict for this security level. Note that if an employee does not have access (via Menu Permissions) to Manager, then the Manager security level settings do not matter for that employee who will not be able to get to the Manager menu. When you are finished, click Save. Your cursor will return to the top so that you can enter additional levels. 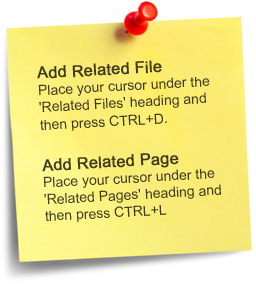 When you are finished, click Cancel, or press the Esc button on your keyboard.